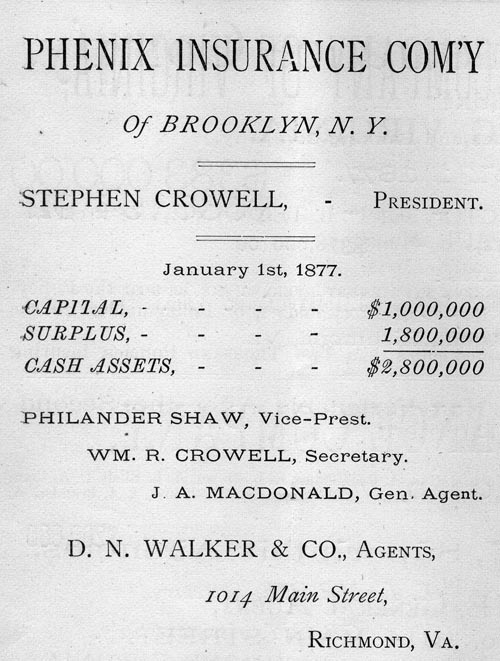 Phenix Insurance Comp'y of Brooklyn, N. Y. STEPHEN CROWELL, President. PHILANDER SHAW, Vice-Prest. Wm. R. CROWELL, Secretary. J. A. MACDONALD, Gen. Agent. 1. The Insurance Advocate, Vol. IX, No. 3, Richmond, VA., March, 1878, page 59.